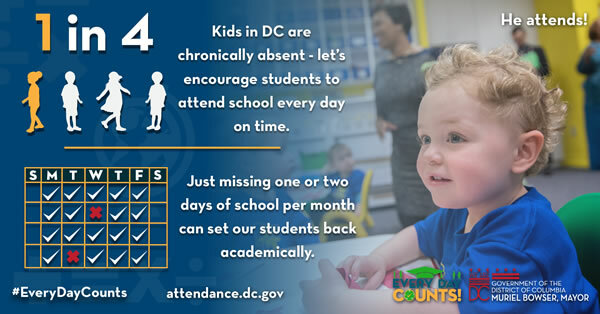 Student Attendance: Every Day Counts! Sign the pledge to commit to improve student attendance this year. I am a K-5th grade student. I am a 6th-12th grade student. I am a community member. Soy un miembro de la communidad. Every Day Counts! is a citywide effort initiated by Mayor Bowser to ensure every student attends school every day. Going to school every day is critical to our students realizing their hopes and dreams. Every Day Counts! will bring together the entire community to support students and families through a public awareness campaign, a Taskforce coordinating public agencies and stakeholders, and investments in data-driven strategies to increase attendance. Learn more about Every Day Counts!